Canadian composer and conductor was born on the 18th of July, 1958 in Gorky (now Nizhny Novgorod), Russia. At the age of eight, he started as a brass band player. At nine, he created his first composition, "Minutes", for piano, which is still performed in Russia and Europe today. At this young age, he was given the chance to hold a conductor's baton in his hand and conduct a short piece during a concert performance. This moment was the source of inspiration which marked the beginnin of a life-long career in music. From his youth up, Shcherbakov’s style was based on the Russian Orthodox Religious traditions (echoes chant, chorale) and philosophical conceptions of Russian philosophers which composer interprets through the prism of contemporaneity and contemporary techniques. As a composer, Shcherbakov graduated from the Nizhny Novgorod State Glinka Conservatoire (1984-1989) with Master's degree in Composition and Music-and-Theoretical disciplines teaching and completed post-graduate studies and received a Doctor's degree in Composition and pedagogics (1/1990-12/1991) under the direction of Professor Boris Getselev. As a conductor, he graduated from the Dzerzhinsk Musical College (1973-1977) with a Bachelor's degree in Orchestra Conducting and Russian Accordion playing under the direction of Professors Anatoly Gubarkov and Yuri Filatov, the Samara State Academy of Arts (1977-1981) with a Master's degree in Choir Conducting under the direction of Professor Anna Glagoleva, and the Nizhny Novgorod State Glinka Conservatoire (Intensive course of Opera and Symphony Conductor Training under the direction of professor Margarita Samorukova, 1/1990-12/1991). These studies represent the culmination of his post-graduate work in Conducting. From 1990 to 2008, Shcherbakov was a Professor of Composition and Orchestration at the Nizhny Novgorod State Glinka Conservatoire and an associate conductor of the Conservatoire's Symphony Orchestra training highly-skilled specialists and travelling widely as a composer, lecturer and conductor. During that period, he performed many world-premieres of works by contemporary composers including his own pieces. Many of his students took part in all-Russian as well as international competitions of composers and were recipients of many prizes and diplomas. In 1981, from 1983 to 1984 and in 1989 Shcherbakov was a Professor of Choir Conducting at the Samara State Academy of Arts. From 1990 to 1997, he was a Professor of Orchestra Conducting at the Dzerzhinsk Musical College. Over the years, Shcherbakov has composed numerous works ranging from children’s music and chamber music to symphonies, instrumental concertos, cantatas and oratories. Many of these have been repeatedly performed in Russia, Ukraine, Macedonia, Switzerland, Germany, France, Belgium and Canada. His professional portfolio also includes a wide variety of arrangements and instrumentations. Further, Shcherbakov has held master classes in composition as well as composition/orchestration seminars and workshops in Switzerland (2000, 2003), Macedonia (2003, 2005), and Germany (2004). He was awarded international residences and grants in Switzerland (Basel, 2000; St. Moritz, 2004; St. Moritz, 2005; Dornach, 2007) and in Canada (Canada Council for the Arts, 2017) as support to pursue his creative skills in music. In 2008, Shcherbakov won the “Saint Symbols of Russia”, an all-Russian competition of composers (Samara). In 2010, he was awarded special composer and choir prizes at the Vancouver International Festival of Russian Music. In 2008, Shcherbakov immigrated with his family to Vancouver, Canada as composer, conductor and University professor and continued to compose and tour as composer and conductor. From 8/2008 to 8/2017, he was choir director at the Vancouver Waldorf High School Choir; from 2009 to 2011-choir director at the Old Barn Community Centre Choir, UBC, Vancouver; from 2012 to 2014-choir director at the Waldorf Community Choir; since 01.08.2008 till present, Shcherbakov is pianist, Dance/Eurythmy accompanist at the Vancouver Waldorf High School. In 2009, being a long term member of the Union of Composers of Russia, he became an Associate Composer of the Canadian Music Centre and a Professional Member of the Canadian League of Composers. 1990 - 2008 – professor of composition and instrumentation at the Nizhny Novgorod state Glinka conservatoire. 8/2008 - 8/2017 - Choir Director at The Vancouver Waldorf High School, Vancouver, Canada. Since 01.08.2008 till present - Pianist, Dance/Eurythmy Accompanist at The Vanvouver Waldorf High School, Vancouver, Canada. 2012 - 2014 - Choir Director at The Waldorf Community Choir, Vancouver, Canada. 2009 - 2011 - Choir Director at The Old Barn Community Centre, Vancouver, Canada. Professional Member of the Canadian League of Composers. 2000, 2001, 2004 - guest conductor of the Municipal Chamber Orchestra "Soloists of Nizhny Novgorod"
– “In doubts” Concerto for cello and a symphony orchestra. – “Quasi balletto” per orchestra. – "A ringing silence" for piano. - Plen Sion Ti izial. For Choir a cappella. Performed by Vancouver Chamber Choir. - When I am sorrowful. For mixed Chorus and Piano. Performed by Vancouver Waldorf High School Choir. 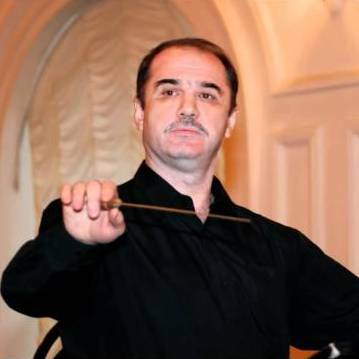 Conductor Evgeny Shcherbakov. IV International festival of contemporary music “Pictures at an Exhibition”. World premiere of the Cello Concerto Number Two for cello, bass voice and strings. Verses from Psalm 142 . Performed by Emil Rovner, cello=bass voice; chamber orchestra "The soloists of Nizhny Novgorod', Vladimir Onufriev, conductor. Nizhny Novgorod, Russia, 08.12.2012. - Notes about the R. Schedrin's orchestral style. The actual problems of musical education, issue 2, Nizhny Novgorod, 2001. - The timbre (sonoristic) dramatic composition in "Self - portrait" ( R. Schedrin). The Russian culture in the young scientists' opinion, issue 10 S-Petersburg, 2002. - The timbre (sonoristic) dramatic composition in "Noveletta" (V. Lutoslavsky). The question of composition and orchestration, Nizhny Novgorod, 2003. - The arrangement and conducting of modern music festivals. Lecture on International forum of festival directors and Managers of new music organizations, Odessa, Ukraine, 2001. - “Who is Who in Nizhny Novgorod Region”, Nizhny Novgorod, 2000. - “Composers and musicologists of Nizhny Novgorod”, Nizhny Novgorod, 2001. - “Who is Who in Russia”, Moscow, 2006. "The music by Evgueni Chtcherbakov makes you cry and makes you happy". "How precisely echoed the music by Evgueni Chtcherbakov in the souls of listeners which have overcrowded the concert hall. It was not a composition on the topical subject, it was really contemporary, well recognizable searches, moral, spiritual impulse towards the lost ideal". "Both styles and epochs run into each other in his talented composition creating one unity". "The art of the composer from Nizhny Novgorod Evgueni Chtcherbakov made a great impression on me. Lofty feelings and broad sonority of his deeply sincere piece called "Mood"(for violin and strings) captured the audience". "The music by Evgueni Chtcherbakov reminds us that God's time is not only the best but it is totally different from ours. This music teaches us to be gentle and to resist the temptation". Prof. Dr. Udo Rauchfleisch, “Prevention and Treating Diseases” (an extract from the report at the forum “Music and Medicine”, Basel, June, 6, 2002. - “The composer Evgeny Shcherbakov is well - known around the world. His music is notable for great emotion and intensity. The religious themes sound again and again. One can hear bell - motif penetrating all through his creation”. From the article “ Im musikalischen Dialog mit Bach und Mozart”, Schwarzwalder Bote, Calw, Germany, June, 18, 2004. - The E. Shcherbakov's music paves the way to middle - european musical tradition in which the unlimited possibilities for improvisation are laid. - “His creation is irreproachable connecting of the mind and heart. Stefan Abels noted his works as the best music from Russia for the last time”. From the article “ Tiefe Einblicke in die Weite der russische Seele“, Schwarzwalder Bote, Calw, Germany, June, 21, 2004. - “His emotional compositions is the fairy window into russian soul”. From the article “Das Fenster zur russischen Seele”, Journal Calw, Calw, Germany, June, 25, 2004. - „The cellist Emil Rovner brightened us all up with movements from the Nizhny Novgorod composer Evgeny Shcherbakov’s Trio for Two ( without piano) in which the debutante cellist revealed that he is also the proud possessor of a mellifluous, resonant true Russian bass voice. Emil Rovner accompanied himself on his cello whilst singing Gebet, a prayer, and then let his hair down for a riotous Tango which reflected the festival’s overall theme of Freedom and its Denial. A violinist appeared playing from the back of the hall, coming on stage to complete the Trio for Two; wild music, with Rovner’s uninhibited singing reflecting the miseries and tensions of Russia’s pre- 1918 social upheavals”. - "Evgeny Shcherbakov is an outstanding Russian composer and conductor ..."
- You just never know who might be working at a Waldorf school. Take, for example, world-renowned composer and conductor Evgeny Shcherbarkov, from the Vancouver Waldorf School, whose latest composition received a standing ovation during its world premiere at the 2017 International Festival of Contemporary Music Yuri Lanyuk and Friends, in Lviv, Ukraine. The festival at the Lviv Philharmonic is considered one of Europe’s centres for arts and culture and has gathered some of the finest and most prominent musicians from Germany, Ukraine, Austria, Switzerland, Great Britain, Canada and more. In Memory of Boris Nemtsov Kyrie was conducted by the composer and performed by award-winning cellist and singer Emil Rovner (Germany), the Galician Academic Chamber Choir and Lviv Philharmonic Academic Symphony Orchestra, and was supported by the Canada Council for the Arts. For Evgeny Shcherbakov, who was granted a special leave by his school, it was a uniquely meaningful experience to be able to attend and conduct his own world premiere: "It was such an honor to me and great responsibility to be invited in Lviv, Ukraine to represent Canada as a Canadian composer and conductor," said Evgeny. This dramatic but hopeful masterpiece can be heard by clicking here. He has been awarded numerous grants and residences for his work, including grants from Prohelvetia Reseaux Est-Ouest | Antenne Budapest, the Canada Council for the Arts, composer-in-residence with international cultural festival “RESONANZEN,” the “Pro Musica e Cultura” Foundation among others. His compositions are performed internationally on stages in Germany, Switzerland, Ukraine, Russia, France, Belgium, Canada and Macedonia.